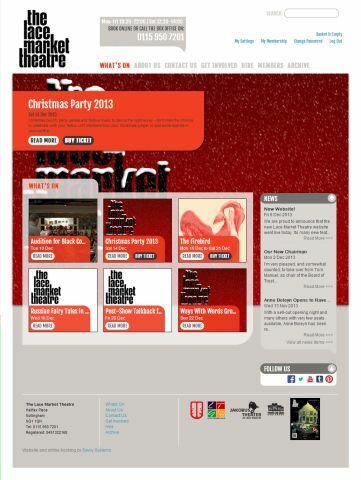 We are proud to announce that the new Lace Market Theatre website went live today. Its many new features, not least the integration with social media, will allow us to keep you as up to date as possible about the latest news and events at your local Nottingham theatre. A huge thanks to David Mews and the rest of the team at Savoy Systems for their hard work. For returning visitors, the need to login to the old website in order to access members sections has been removed. The login to purchase tickets and to access member's areas of the website is now one and the same. So if you've purchased tickets online before, you will not need to setup a new account. Any problems please contact the Publicity team here.